Home Carolynne Arts and Culture Songs of Innocence… really? 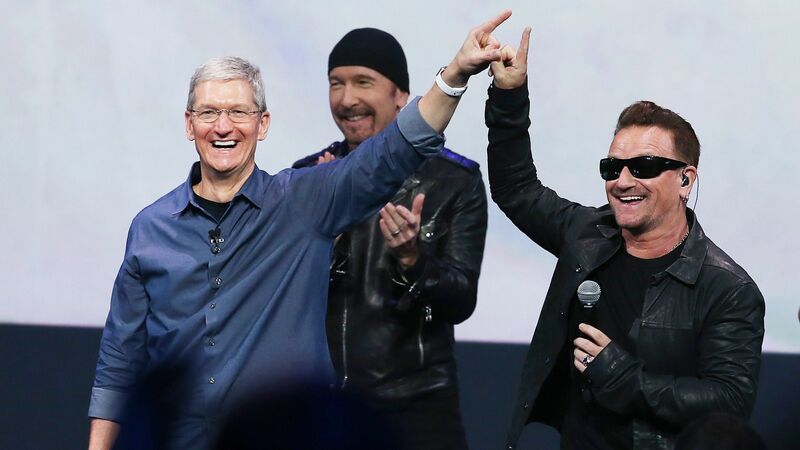 U2 celebrates the free distribution of their album with Apple CEO Tim Cook. If you’ve been on your iTunes library recently, you might have been surprised to have found U2’s new album, Songs of Innocence, without you having purchased it. This is because it was released as a free gift to all iTunes users; Apple paid U2 what some sources say was up to $100m as part of a deal to have their album available for free for a limited period of time. For those with automatic downloads turned on their iPhones, the music would be in the middle of a shuffle without people even knowing they had it. This album has been advertised as being at the peak of U2’s career, since it has been publicized as incorporating the band’s history and influence from their social commentary of their native Ireland to the so-called ‘transformative pilgrimage’ to the United States. iTunes went as far as declaring this initiative as ‘the biggest album release in music industry’ on their website. On one hand, this could be read as a demonstration that bands might be more willing to upload their music for free in the future, after years of controversy amid the frequent use of file sharing websites for downloading music, most notably with the argument between Metallica and Napster back in 2000. It must not be ignored that, at the end of the day, this is a massive marketing campaign which benefits U2’s interests more than the average music listeners’. U2’s image as a philanthropic band is marred by its collaboration with one of the biggest money-making companies in recent history, a collaboration that allows the band to make a profit without even considering whether the album will be appreciated or not. Even though iTunes users are free to listen to the album, the lack of consent in owning the music devalues the medium; it’s suggesting that it doesn’t matter whether you pay for it or not, or even if you enjoy it. This means it loses value in terms of actual price but also of actual appeal. The Entertainment Retail Association has also called this album release ‘damaging’ because it causes people to refuse to spend money for upcoming musical acts in favour of giving support to well-established bands who are more willing to release their music for free because they are already wealthy as it is. A capitalist vicious cycle some could say. Perhaps it would have made more sense for U2 to release the album through their own website, as it would have placed more emphasis on the band giving music for free for their fans specifically. Instead, anyone with iTunes, whether they like U2 or not, has received this ‘gift’ while the band makes a hefty profit from the deal with Apple. It is unknown whether Songs of Innocence will be the first of a series of albums by major bands to be released for free online. What is known, is that if other bands do try a similar stunt, the value of music will be put under question.